Manuel Otero, Director General of IICA (left), and the Executive President of CAF, Luis Carranza Ugarte, after officializing the partnership between the two entities. San Jose, 29 November 2018 (IICA). The Executive President of the Development Bank of Latin America (CAF), Luis Carranza Ugarte, and the Director General of the Inter-American Institute for Cooperation on Agriculture (IICA), Manuel Otero, signed a broad agreement in Lima that will mobilize resources from both institutions to foster public and private investment in the agriculture, forestry and fisheries sectors, as well as drive rural development. As part of the initial actions derived from the letter of understanding, the institutions have carried out missions on the border between Haiti and the Dominican Republic as well as in the Amazonian region of San Martin, in Peru, in order to identify production development projects. CAF and IICA will also contribute to the Plan for the Modernization of Panama’s Western Region. 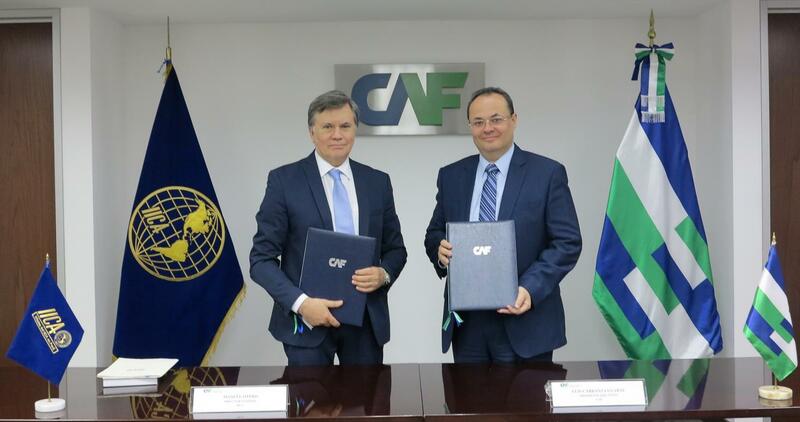 “This partnership is founded on and recognizes clear complementarities between CAF and IICA, between the fields of funding and technical assistance, between infrastructure and production development,” stated Otero. “The partnership also recognizes the importance of IICA’s extensive territorial presence,” he added, in reference to the hemispheric agency’s 35 offices, located in IICA’s 34 Member States as well as in Spain. The Executive President of CAF, Luis Carranza Ugarte, noted that both institutions sought to increase public and private investment through this initiative, in order to foster innovation and generate positive effects with respect to productivity, equity, inclusion and poverty reduction in the region. “To address inequality in our countries, we must reach an agreement on productivity that would enable us to preserve the social improvement achieved over the past few decades, as well as to generate greater inclusion and equity, especially in rural areas,” he remarked. The agreement, which will be effective for five years, will also aim to modernize institutional frameworks in these sectors, as part of a partnership that will focus on strengthening value chains and market access; facilitating activities related to the recovery and sustainable use of soils; strengthening agricultural insurance systems and other risk management mechanisms that play a key role in addressing the effects of climate change; and promoting quality standards in matters related to health, food safety and traceability. The agreement also will also allow for supporting systems related to technical assistance, rural extension, institutional strengthening and public policymaking, as well as processes related to associative undertakings, the use of agricultural information and technological innovation. The partnership between CAF and IICA will also strengthen environmentally friendly businesses, including biotrade, ecotourism, the forestry and agro-forestry sectors and silvopasture. The agreement between the two entities primarily responds to the need to strengthen the agriculture sector through funding as well as by developing the infrastructure required to incorporate agricultural products into markets in a more efficient manner. The Development Bank of Latin America (CAF) is a financial institution comprising 17 Latin American and Caribbean countries, Spain and Portugal, as well as 13 private banks in the region. It promotes a sustainable development model through credit operations, non-reimbursable resources, and support in the technical and financial structuring of projects in the public and private sectors of Latin America.